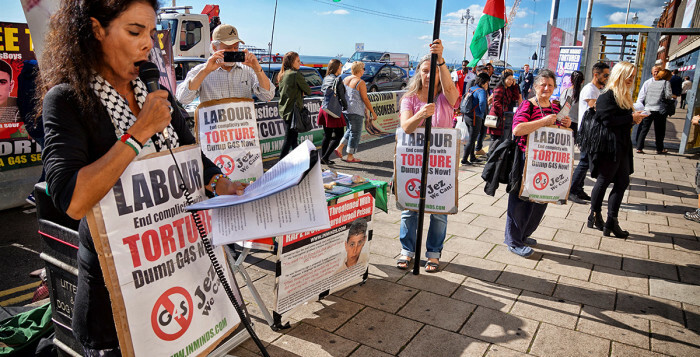 It has emerged that the Labour Party decided at its national executive meeting on Tuesday to boycott the private security company, G4S, that has provided its conference security in recent years because it helps Israel run prisons at which Palestinian political prisoners are held without trial and subjected to torture. Protests have taken place both outside Labour’s conferences in recent years about the issue. G4S provides equipment and services to Israeli prisons at which political prisoners are held without trial and subjected to torture. In October alone, Israel arrested over 1,000 Palestinians as a means to stifle Palestinian popular resistance. Many of these people will be held in Israeli prisons that G4S is helping to run. By helping Israel to run such prisons and “interrogation centres”, G4S is participating in Israel’s use of torture and mass incarceration of more than 6,000 Palestinians as a way to discourage any action to resist its occupation. G4S also has contracts with the Israeli government to provide equipment and services to checkpoints that make up the Apartheid “separation” wall, crossings that enforce the siege of Gaza and Israeli police stations. G4S guards also operate at various Israeli military bases. In 2012, at the height of a historic hunger strike by Palestinian political prisoners, Palestinian organisations called for action to hold G4S accountable for its role in Israel’s prisons. Facing mounting international pressure, G4S announced in 2014 that G4S “did not expect to renew” its contract with the Israeli Prison Service when it expires in 2017, and it has also said it will end some aspects of its involvement in illegal Israeli settlements. However, G4S continues to profit from Israel’s abhorrent prison system and has not withdrawn from any of its contracts with Israel. War on Want argues that the company’s rapid growth in recent years has been “driven by the privatisation of security, warfare, prisons and a range of public services”. In a week that the G4S share price hit a 52 week low, it would do well to reconsider that failure without delay. By taking this action, the Labour Party has boosted the campaign for Boycotts, Divestment and Sanctions (BDS) against the Israeli occupation of Palestine. Although party managers have previously resisted pressure to boycott G4S, the election of Jeremy Corbyn as leader has resulted in the restoration of effective powers to the elected executive to make decisions on such matters in line with the party rule book. It is understood that the matter was pushed to a vote and carried by 12 votes to 4. More information on G4S and its role in “globalising injustice“: can be found in this excellent briefing from War on Want or at the Palestine Solidarity Campaign. Who mourns for the Palestinians? Posted in: Civil Liberties, Crime/Justice/Prisons, International, Labour, Middle East/North Africa, Politics. We should not be using that firm because they are rubbish, as we saw not to long ago, but now they are expected to take over the running of the back room offices within the police forces throughout the country . I’m afraid that whether they look after Israel jails or not the fact is this company has a record of poor working conditions and low pay. Gift for understatement more than somewhat? G4S are an evil company that have been employed to break strikes, operate detention camps, enforce political repression with a proven track record of brutality and even murder across to globe. In view of that I complained to EDF that I didn’t want these people employed by this company coming into my home to read my electricity meter, the response from G4S was eventually a nasty and threatening note from one their managers to the effect that if I didn’t like it, they could always find an excuse to come round and kick my front door in. Again this seems to be just the tip of iceberg. I think you are correct, efficiency is one of the reasons we as a party should not use this or that company to fulfill our contracts. However, we are a political party, we are here to make political decisions and to have political principles. On those terms in my view then G4s should never get another penny from the Labour Party. But if you look at all the very big companies who do security they are all the same. Many of the smaller companies are involved with the bigger ones as well. The Welsh Assembly decided to use a local company to do it’s Conference, they said they would not go out side of Wales, bingo they used a company which was on the list of Sub contractors of G4S and the money paid went to the G4S company. It’s getting harder to find firms not involved with the giants. They also make profits by cutting wages – a Neo-Liberal Champion of Cheap Labour. G4S – Greedy 4 Selves (their repulsive bosses). What a refreshing change from Progressive Labour under JC. Under Blair the security guards were working for free,the ones who tried to take Walter Wolfgang out, for telling Straw he was talking rubbish. Internal stewards are not security , as we saw with the thugs who removed this gent they were not trained. But labour has always used a security firms to check people coming in and the main one used has been G4S. They were the security at the one in 2014 not sure about the last conference. am I right that Theresa Mays husband has some thing to do with G4S? Philip May also has shares of course in other major companies, he is we are told an unnamed share holder in G4S, as a banker of course with loads of money especially from the moderate side of the labour party he is able to buy these shares..
Good. The terrorist state of Israel needs all the shunning we can give it. The big move however will be when the Palestinians find a leadership that will break from the bogus two-state peace lie. That means breaking with the repulsive Bantustan-running, refugee abandoning, Zionist collaborating Palestinian Authority and Fatah in the West Bank and with the Ghetto Gangsters of Hamas in Gaza. One, unified, secular, democratic Palestinian state encompassing Israel, West Bank and Gaza in which Muslims, Jews, Chrisitans and those of no faith can live in harmony and to which the refugees can return to new jobs and homes. When will people like you understand that Jews have as much right to their own nation as Scots, Irish or anyone else? How do you think this “secular democratic state” of yours would work? Who would be in charge? The same people who run oppressive medieval theocracies in Iran, or dictatorships in Iraq? The truth is that you want to see the Jews disempowered. Neither I nor most other Jews would trust you as far as we could throw you, and we will support Israel as we have every right to do. And before you start talking about divided loyalty, stop and think about the Jewish soldiers who have shed blood fighting for this country. But of course jews do not have as much right to their own nation. Nations are the opposite of the sectarian religious empire that is Israel. Nations were carved out of the old feudal religious empires and established democracy. The trend for returning to religious imperial states like Israel and the Caliphate are ultra reactionary and their spread across the globe are the form that barbarism is taking. Zionism and Islamism are not opposed they are identical. If, after studying the issue in depth to the point where you feel able to offer a real solution rather than point-scoring rhetoric, we would be happy to hear from you. Until then, you are urged you to keep your uneducated opinions to yourself. Another peace offer rejected by the Palestinians http://www.thetower.org/2580-breaking-abbas-admits-for-the-first-time-that-he-turned-down-peace-offer-in-2008/ 610 terror attacks on Israel, including by Prada wearing Palestinians who live and vote in Israel. You guys just don’t get it, do you? One can only suppose they were hoping to receive a kick-back from G4S. There seems to be a very strong consensus, (right or wrong,) that that’s what’s going on here and this certainly looks like yet more of exactly same kind of corruption, graft and malfeasance that so outrages and demoralizes voters and about which the PLP, (“you can hire an MP the same way you’d hire a London taxi,” seem so sanguine. Some MP’s not all , but yes I think a number of MP’s are up for sale at the right price of course. hence a large proportion of the people of this country have decided voting for Tories or Labour is worthless, all you get are people for hire. i don’t think this provides the full context to the decision and is being used as hasbara propaganda by right wing zionists and those who want to damage jeremy. yes, israel is a fascist regime and there is a vast amount of irrefutable evidence to back this up. this decision however comes originally from an EDM tabled by jeremy in 2013.
it isn’t JUST about israel and by saying it is plays into the hands of the hasbarists who want to damage jeremy AND fails to shine a light on the entire catalogue of appalling behaviours of G4S, including [deleted for legal reasons – Ed]. That this House welcomes the Secretary of State for Justice calling in the Serious Fraud Office to investigate G4S; notes that the company’s failure to co-operate with a voluntary audit of its billing practices into its tagging contract raises serious questions about the company’s credentials and other contracts to provide public services; further notes the jury verdict of unlawful killing into the death during the deportation of Jimmy Mubenga at the hands of three G4S guards who unlawfully restrained him, with his hands cuffed behind his back while he was seat belted into a seat on a BA flight at Heathrow raises serious concerns about G4S’s treatment of vulnerable people in its care; notes G4S’s failures over the provision of security for the Olympics in 2012 suggesting an urgent inquiry is required into all of the company’s Government contracts, including its handling of Palestinian prisoners in Israel; and calls on the Government to review all Government contracts with G4S. It is a shame that you choose characterize Israel as a fascist regime. However appalling Israel policies are as an occupying power, and the inequalities and repressive legislation it is increasingly responsible for even within Israel proper, this is not an accurate description of the Israeli state within its own territory. The Zionist state is restrained in its actions only by the need to worry about public opinion in the Western states that fund it. When it can get away with it such as when it mercilessly bombs the Gaza Ghetto it is as fascistic as ISIS and the Zionist settlers in their constant quest for lebensraum are no better than Nazi shock troops.